Mighty No. 9 gets a not so mighty trailer, and we discuss No Man's Sky delays and Overwatch selling out at Amazon. Diehard GameCAST: Episode 78 – Dark Souls III, Bravely Second, Thief, Ratchet & Clank, and more! We talk NX, cheating in The Division, and the "right" way to play Dark Souls III. Diehard GameCAST: Episode 75 – Megadimension Neptunia VII, Fantasy Life, Pony Island, and more! We've released the podcast in parts... just kidding, but we do talking about episodic content in games. Diehard GameCAST: Episode 74 – Yakuza 5, God Eater 2, Xenoblade Chronicles X, and more! Happy New Year! We talk games of 2016, the latest Nintendo Direct, and the lack of a new Assassin's Creed and Scalebound this year. 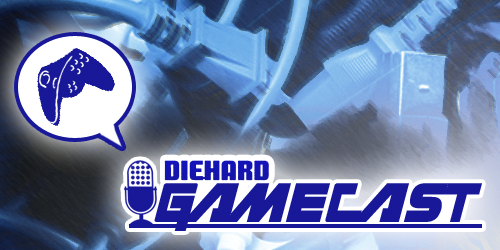 Diehard GameCAST: Episode 73 – Fallout 4, Trails in the Sky SC, Moco Moco Friends, and more! More topics, shorter episode. How did we do it? It's a trade secret. Look forward to GOTY 2015, Koei Tecmo discussion, blacklisting, and more! Diehard GameCAST: Episode 71 – Rock Band 4, Senran Kagura 2, Demetrios, Ninja Pizza Girl, and more! The topic of the day is TGS 2015, but kinda not because it became an afterthought after all of the other shenanigans (so like every other episode). Mad Max, DLC, and Samus Aran's gender are all on deck for tonight's discussion. Diehard GameCAST: Episode 69 – Splatoon, Persona 4: Dancing All Night, Assassin’s Creed III, and more! After a brief hiatus, we're back talking about Gamescom 2015! Diehard GameCAST: Episode 68 – Persona 4: Dancing All Night, Mario Maker, Mario Party 10, and more! It's the E3 2015 recap episode! E3 predictions and leaks abound, as well as more amiibo talk and the Nintendo World Championships. Diehard GameCAST: Episode 65 – Bloodborne, Final Fantasy Type-0 HD, Watch Dogs, and more! What is Nintendo doing? We attempt to answer that in regards to the recent amiibo crisis as well as talk about their current Youtube policies. It's another Monster Hunter 4 filled episode, though we also chat about Rock Band 4 and this year's GDC. The New 3DS XL and Monster Hunter 4 Ultimate just released and we share our thoughts on that. Oh, and some other stuff happened. Diehard GameCAST: Episode 62 – Resident Evil, Brandish: The Dark Revenant, Yakuza 5, and more! A discussion about narrative vs gameplay mechanics ensues, along with coverage of the latest Nintendo Direct. Diehard GameCAST: Episode 61 – Dragon Age Inquisition, Midde Earth: Shadow of Mordor, Wolfenstein: The New Order, and more! It's our first recording of 2015! Join us for discussion of the Majora's Mask remake and our most anticipated titles for the first quarter of the year.